The past 18 months for Vance Joy read like a dream. In addition to a plethora of local achievements (which we’re all very familiar with by now), things are currently starting to heat up for the musician overseas. Last week, ‘Riptide’ cracked the Billboard Hot 100 in the US, entering at #92, after assuredly conquering the influential Alternative Radio charts. The track is being streamed in excess of three million times worldwide each week and is up to over 50 million streams on Spotify. It has clocked up over a million sales: already certified platinum in Sweden; gold in Austria, Canada, Germany, Ireland and New Zealand; and silver in the UK. In Australia, ‘Riptide’ is now closing in on 5x platinum sales. On the touring front, there are multiple, sold out shows in the UK and Europe, along with Canada and the US, nestled amongst festival performances at Glastonbury (where Vance Joy was dubbed one of five ‘Best Bands To See’ by The Independent), Lollapalooza and the upcoming Splendour In The Grass. 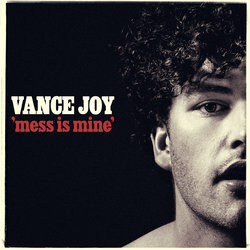 After conquering the world’s charts with ‘Riptide’, Vance Joy tugs at the heart-strings with ‘Mess Is Mine’. A charming, folky lament, and proof that he is here for the long haul, the single is taken from Vance Joy’s debut album Dream Your Life Away.